Based in New York and with a distinct sound somewhere between Doom/Death and Prog Metal, Grey Skies Fallen here present their latest release, a four-song EP with Travis Smith artwork that showcases their sound well and promises even better things to come from these underdogs. They’ve been around since 1997, have released three full-length albums and have a real passion for the music they play, as a read of their biography will show. Along Came Life is a strangely old-school sounding EP, the songs contained being genuine songs as opposed to collections of riffs, and it bears up to repeated listens surprisingly well. Vocalist Rick has the sort of singing voice that sounds odd at first but soon makes you fall in love with it, and once you’ve gotten used to the band’s sound overall it’s hard not to love the rest of the EP, too. Along Came Life certainly pushes the Doom/Death elements over the melancholic prog that Two Way Mirror did so enjoyably, although there are moments of the latter like the lovely opening to The Grand Scheme Of Things, an intense piano-backed bit of what is generally called Dark Rock (that chilly hinterland between doom and goth). By The Wayside follows suit, with dips into atmospheric near-ambience, that piano coming into its own before vanishing completely, and Forever And A Day moves towards quirkiness with a bizarre-sounding bit of plucking before launching fully into riff-driven doom/death with harsh vocals and melodic flourishes. It’s the title track which I enjoyed the most, however, a slow, seven-minute piece opening with almost Eastern-sounding instrumentation and an impressive vocal performance that slowly turns into guitar-driven melodic prog. Great stuff. As with most modern EPs, it’s hard to recommend this as anything but a good primer for the band’s sound or a curio for fans. 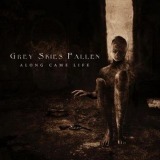 Those new to Grey Skies Fallen should certainly investigate further, however, perhaps continuing with their previous full-length Two Way Mirror – a great reminder of what jewels lie awaiting beneath the big names.